Heritage Acceptance has a fresh, new look! This entry was posted in Uncategorized on October 5, 2017 by aneely@hfgnet.com. 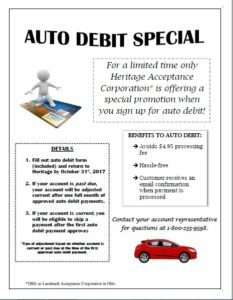 For a limited time only, Heritage Acceptance Corporation is offering a special promotion when you sign up for auto debit! This entry was posted in Uncategorized on October 3, 2017 by aneely@hfgnet.com.